“The Stone is a not-for-profit performance space dedicated to the EXPERIMENTAL and AVANT-GARDE. “There are no refreshments or merchandise at The Stone. Only music. All ages are welcome. “There are no advance ticket sales. 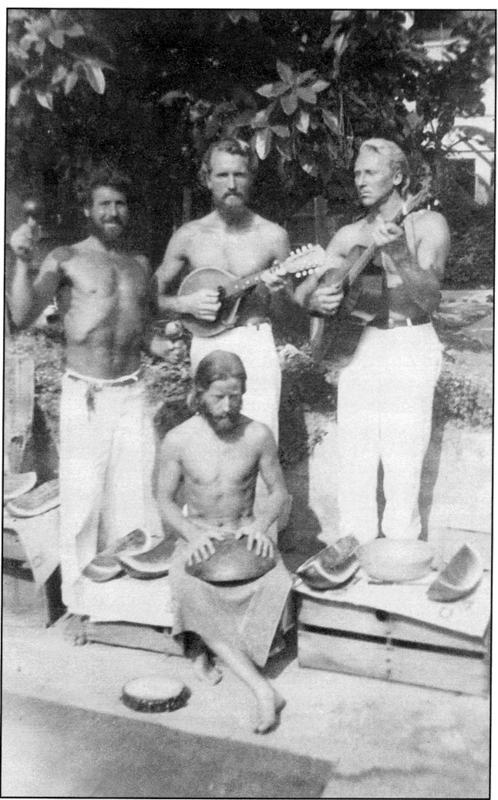 730 21st Street, NW, Washington D.C.
Natural music and vine ripe watermelon with Gypsy Boots and his talented friends on a summer day in Hollywood,1948. Gypsy Boots and his pals would often travel over 500 miles just to pick and eat some fresh figs. Seven of California’s “Nature Boys” in Topanga Canyon, August 1948. 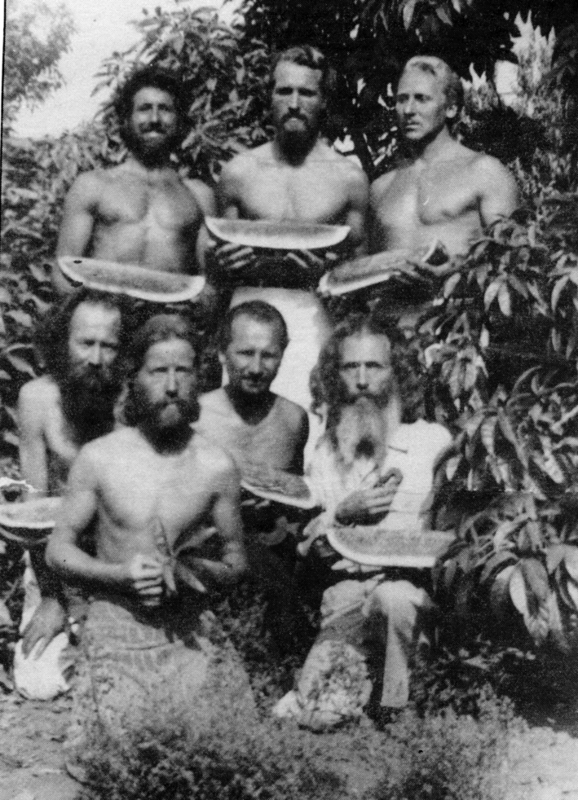 They were the first generation of Americans to adopt the “naturemensch” philosophy and image, living in the mountains and sleeping in caves and trees, sometimes as many as fifteen of them at a time. All had visited and some were employed at “The Etropheon” where John Richter gave his inspiring lectures about raw foods and natural living. This magnificently illustrated book chronicles the philosophy, lifestyle and dissemination of Lebensreform, (Life Reform – “neither communism nor capitalism, but land reform”). 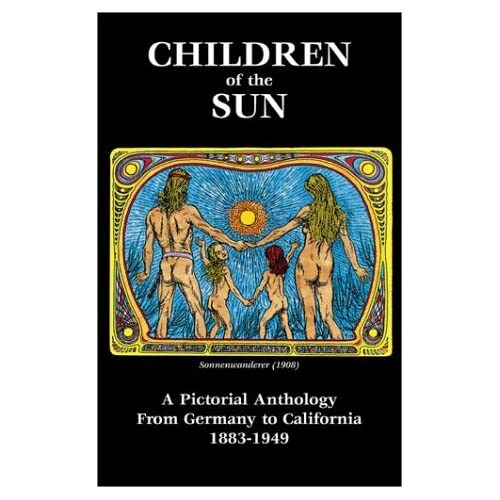 In reaction to industrialization, from Hermann Hesse and the artist Fidus wanderings through pre-WW1 Germany in edenic bliss to Bill Pester going natural in a Palm Springs canyon. Pester, a German born immigrant, was counted in the 1920 census as one of the 24 members of the Cahuilla tribe. 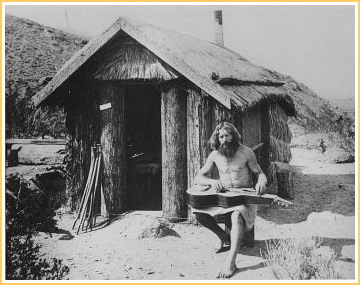 Bill Pester at his palm log cabin in Palm Canyon, 1917; note palm blossoom walking sticks leaning on left side of the door. "Bread and Puppet continues, more than 40 years on, to live an ideal of art as collective enterprise, a free or low-cost alternative voice outside the profit system." FOR the first time in many summers the Bread and Puppet Theater will travel nine hours from northern Vermont for a New York City gig, at Lincoln Center on Wednesday evening. Then the troupe will turn around and ride back to its farm just below the Canadian border, where it will put on the same show. You can easily spot the group en route: 1963 school bus, painted sky blue, with a mountain landscape, an angel and a beaming sun on the side. 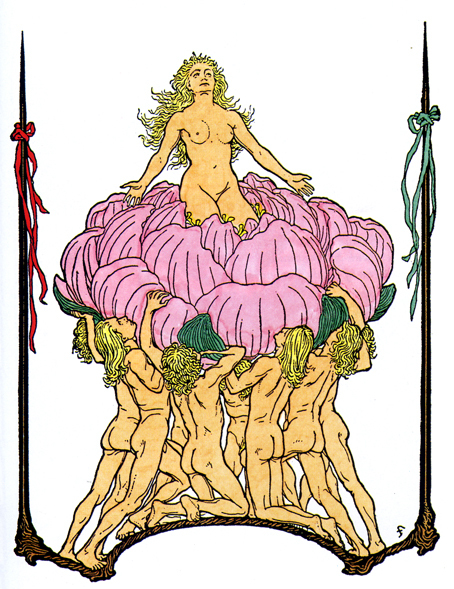 People who know of the troupe without really knowing its work tend to link it to political street theater of the 1960s, an accurate but incomplete association. Recently I’ve been thinking of the theater in a contemporary context. At a time when the art industry is awash in cash and privilege, and theater tickets routinely go for $100 or more, Bread and Puppet continues, more than 40 years on, to live an ideal of art as collective enterprise, a free or low-cost alternative voice outside the profit system. I have another association with the troupe: Bread and Puppet gave me the single most beautiful sight I’ve ever seen in a theater. That was in 1982, in the sloping, wide-open field that is part of the theater’s farm in Glover, Vt. There the collective was presenting a two-day festival, Our Domestic Resurrection Circus, as it had done almost every summer since relocating from the Lower East Side of Manhattan in the early 1970s. Suddenly four dark puppet horses with devil riders wheeled in from afar, backed by a huge dragon. Almost without warning the devils waved black banners over the villagers, who fell to the ground, dead. The devils then piled the houses and horses together and set them alight. Good and evil alike were in flames. Moral chaos. End of story. But not quite. As the fire burned, a half-dozen great white gulls or cranes — muslin kites carried on sticks by runners — soared up from the horizon and started flying in our direction. They came right to the flames and soared over them as if looking for signs of life. 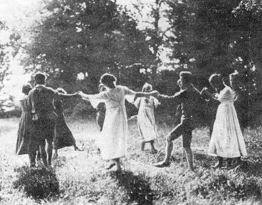 Then they circled back across the field, melting into darkness. It was fantastic. Only when they were out of sight did I see that night had fallen and stars were out. It felt like an impossible trick of stagecraft, a miracle. I had been simultaneously transported and pulled back to earth.